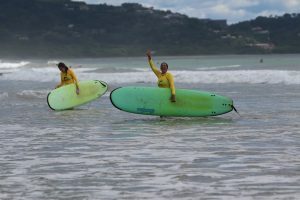 Surf safety and surf etiquette are paramount to an enjoyable surf session for everyone involved. Surfing is fun, it’s adrenaline-pumping and life-changing. Surfing can also be dangerous to you, and those around you. Like any sport or activity, there are guidelines for best practices. Keep reading, to discover how you can maximize your own surf etiquette and general surf safety while minimizing the chance of accidents. 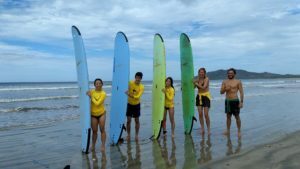 No one wants to experience conflicts with other surfers, but everyone enjoys good vibes and good karma! Select the most appropriate location for your skill level. If in doubt, ask your local surf shop. The surfer closest to where the wave broke has priority, or in some places, it’s the person first on their feet. Use discretion and your observation skills and remember, if in doubt, don’t drop in! Stay out of the way of other surfers- when paddling out, paddle towards the broken part of the wave so you avoid interfering with surfers on the green face. Don’t be a wave hog- take turns, encourage others. Be observant, pay attention at all times. Assist a fellow surfer in trouble or distress. Spend a little time speaking to locals before surfing- figure out the local vibe, how best to fit in. Your board is a missile and has the potential to harm another person. Never ditch your board when a surfer is behind you- hold onto it like a life depends on it. Remember a 9ft board with a 9ft leash has a reach of close to 20 feet…. and your fellow surfer on a similar board has the same… try and keep a good 40ft from other beginners. Surf etiquette is something all good surf schools should teach. 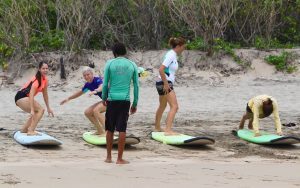 A quality surf lesson, with a mature instructor and good track record will start you off on the right foot! Remember to relax, have fun, and don’t be a jerk. Smile, share and lift the spirits of those around you. 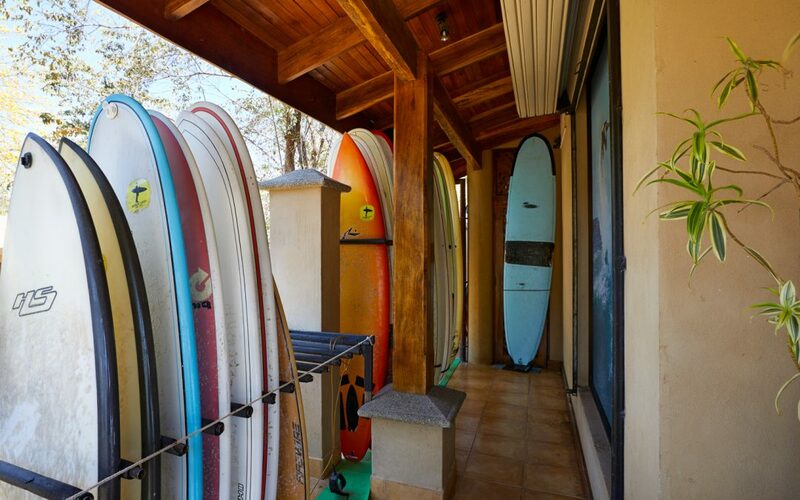 Before heading out to surf, consider a good warm up, a work-out, getting some of the extra energy out. In this way, you aren’t depending on catching 50 waves at the expense of everyone else’s fun! 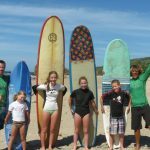 Taking a surf lesson or a series of surf lessons while on vacation is a great introduction to surfing- a sport the whole family can enjoy! 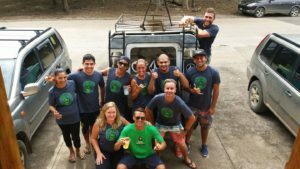 Why Frijoles Locos for your Surf Lessons in Playa Grande? 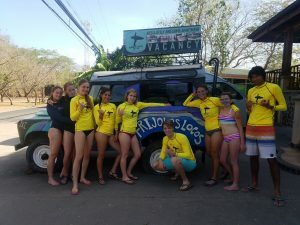 Frijoles Locos Surf School, provides quality surf classes, with safety the highest priority. 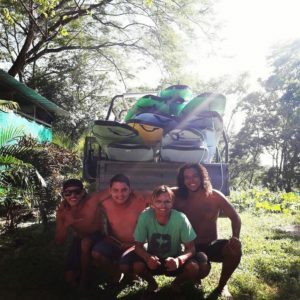 Undoubtedly, the fun, excitement, laughs, and all round great physical work out will boost endorphins and leave you feeling like you achieved something while on your Costa Rican vacation. 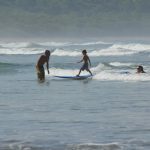 Playa Grande, located in the province of Guanacaste, Costa Rica, is a long sandy beach, with no rocks or reef and consistent waves, suitable for all levels of surfer. The beach has many surf spots to utilize, to escape the crowds and find your very own area on which to practice. 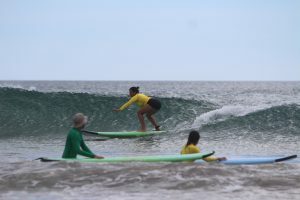 Surf lessons with Frijoles Locos Surf School include 90 minutes of professional instruction, the use of the surfboard for the duration of the lesson, quality long-sleeved rashguards to protect your skin against abrasions/ rash from the surf board, and transportation within Playa Grande. Frijoles Locos Surf Shop offers surf classes for all levels. Our most commonly requested lesson is the beginner surf lesson. 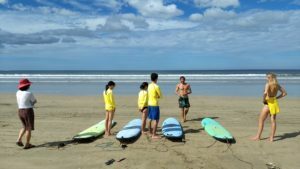 Intermediates or those wanting to get comfortable at a new break can request a surf coach to accompany them for a surf session. Advanced coaching is available upon request. 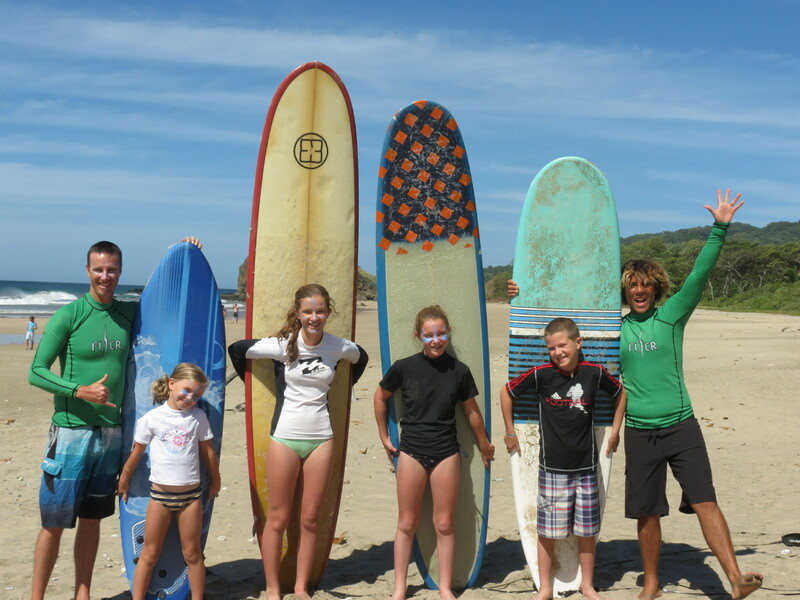 Budding young surfers can enjoy a lesson, from age 3 and up. These menehunes as they are called in Hawaii, or Groms as the Aussies call tiny-tot surfers, will require one-on-one instruction and advance notification will be necessary. There is nothing like seeing your little one enjoying the beauty and natural rush of catching a wave. 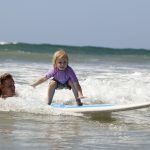 Parents of younger children have expressed interest in having an introductory surf lesson for kids as young as 3 years old. 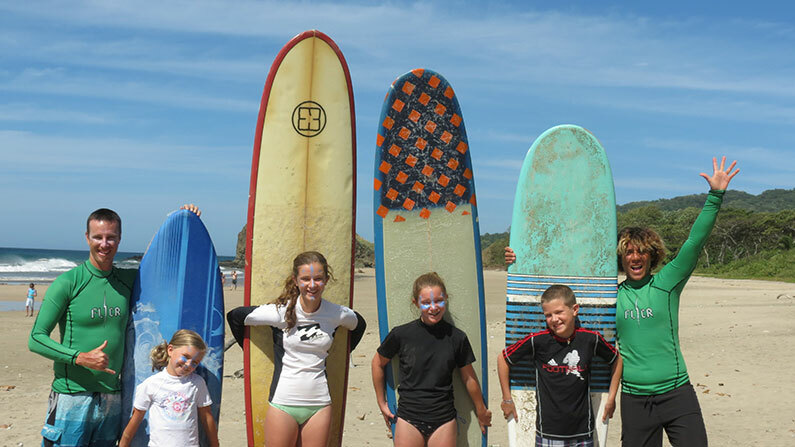 We take each child on a case-by-case basis and with the parent’s involvement, can create a fun start to surfing for these little ones too. The tide will be very low, the water very shallow, and safety paramount. 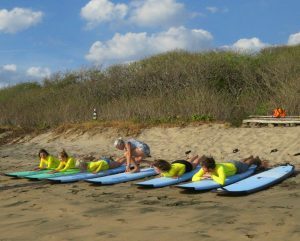 We have taught hundreds of visitors to surf, with instructors who are CPR qualified, mature minded, and with years of ocean experience. 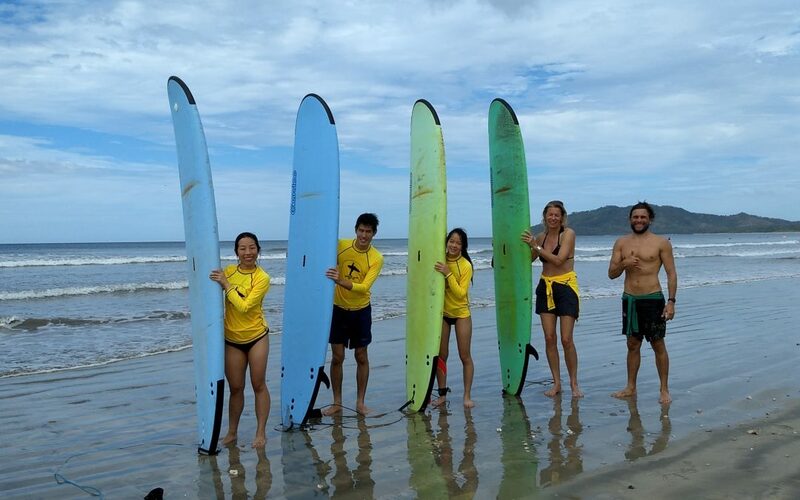 Safety is #1 priority, and we use the best equipment (Gnaraloo soft surfboards), the best surf instructors, and select the best part of the beach to learn to surf on any given day. Many of our customers come from the Papagayo region, as Playa Grande is one of the closest and best surfing beaches in relation to the Papagayo area. 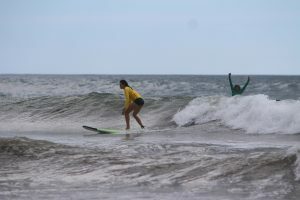 Playas del Coco, Ocotal, Riu Guanacaste, Westin, Playa Danta, and the Flamingo area are all within easy driving distance to Playa Grande for surf lessons. Call us if you would like transportation arranged or require driving directions. Driving directions can also be found in our Blog. Check out these photos of surfers of all ages having the time of their lives and we look forward to seeing you here doing the same. 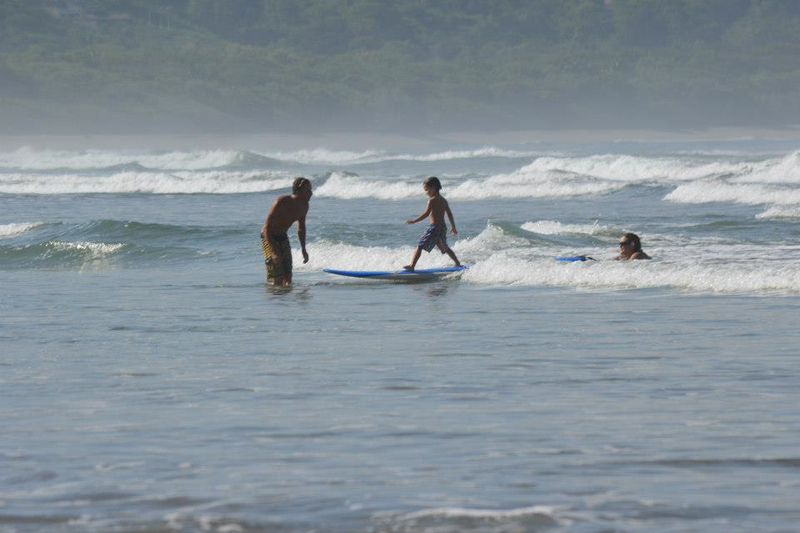 Contact us to pre-book your surf lessons for your next visit.